The Warrior Code of Ethical Behaviour (Bushido) provides the background for today's Martial Arts by teaching such virtues as discipline, honour, respect and humility. The main goal of the Martial Arts is self improvement. Do not engage in any activity that may degrade your personal integrity, your family, the code of ethics of your club or the Canadian Jiujitsu Council. During practice treat your training partner in the same manner you would like to be treated. Giving way to others is not a sign of weakness. Do not criticize others. Assistance must be given at all times by the higher ranks to the lower ranks. bullet	Never use a technique which is beyond your capabilities. The training uniform must be kept clean at all times. bullet	Do not misuse your knowledge of the Martial Arts inside or outside of the club. Your goal is to become your best... 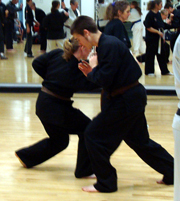 Note: the best Martial Arts training begins with courtesy and ends with courtesy. "That which we persist in doing becomes easier- not that the nature of the task has changed- but our ability to do has increased.